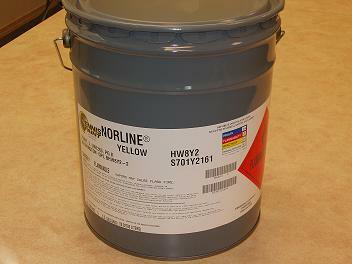 HW8Y2 Yellow and HW8W1 White | Alpine Products, Inc.
Theses paints meet the Washington State specification for Instant Dry Highway Marking Paint. These are extremely fast drying paints, less than 60 seconds dry to no-pick up and designed for no heat application. They may be applied by air or airless equipment withouth the need for coning and with a minimum of traffic control. 1. Coverage:93 sq ft. per gallon @ 15 mils wet film thickness, yields 8-10 mils dry film. 2. Reflective glass media: Type A drop on beads at 6-8 lbs/gallon dispensed with pressurized bead gun system. 3. Storage stability: 6 months with a viscosity increase of less than 10 KU (krebs Units) measure of viscosity at a temperature of 50 degrees F and above. 4. Minimum application: Should not be applied below 50 degrees F.
B. At 50 degrees F – 86 KU max. C. At 122 degrees F – 66 Ku min. White – 12.00 lbs min. Yellow – 12.00 lbs min. White – .92 min % of complete hiding over black and white. 5. ASTM D1644 Non-volatile content 65% – 68% solids. Measure of binder plus pigments weight total. 8. ASTM D522 Flexibility: Pass 1/2 in mandrel bend of paint film cast on a test panel. 9. Dry to no-pick-up (beaded): 15-35 seconds based on a road cry test. 10. ASTM D969 & D868 Bleeding over asphalt: 90% min brightness maintained. The material shall not show evidence of heavy caking or settling which requires mechanical means to return the product to useable condition for a period of one year from the date of manufacture or date first shipped. These paints do not form a dried surface layer or skin. They re-dissolve in their own solvents preventing a thick build up in drums or on tank walls. These paints are available in 50 gallon steel drums, 5 gallon pails, and 340 portable tanks.